and a bigger HELLO to ALL my loyal readers and friends. Now, in this special entry right here, I'm gonna let you in on some new and cool travel tips that I recently just came across. On top of all these, there will be giveaways too. So did I managed to pique your interest already? Read till the end to find out how to win them!! Have you guys heard of Tripool? 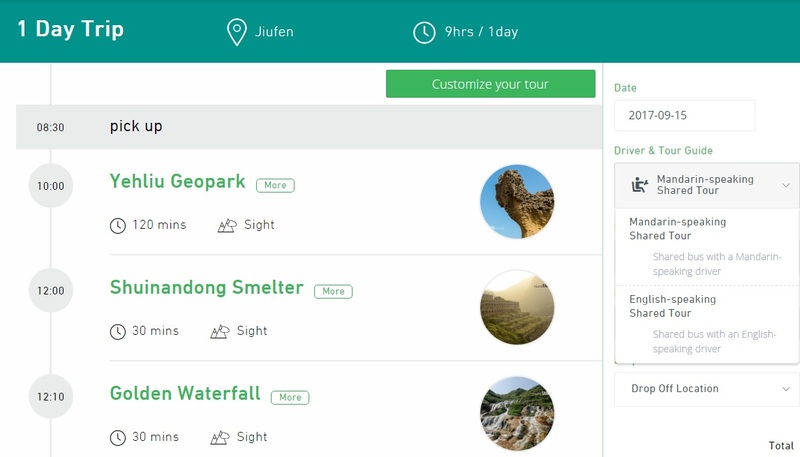 It is a revolutionary way to enable travelers to enjoy the cost-benefit of carpool, meanwhile also having the luxury to customize itineraries for the scenic areas chosen. It's pretty much like a shared tour except that you can customise where you want to go or see. It is something like UberPool or GrabShare but in a bigger touristy way. Today, I'm honoured to be given the chance to promote Round Taiwan Round which is one of many trusted partners of TriPool. They received Trip Advisor's Certificate of Excellence for 3 years in a row now. Loads of good reviews on Trip Advisor, do go and check them out! They have handcrafted more than 50,000 customised itineraries for global trotters. Thus, you don't have to worry too much. You may also apply for a free quote on their website. More than 10% of English-speaking visitors have used this site to plan their itineraries. 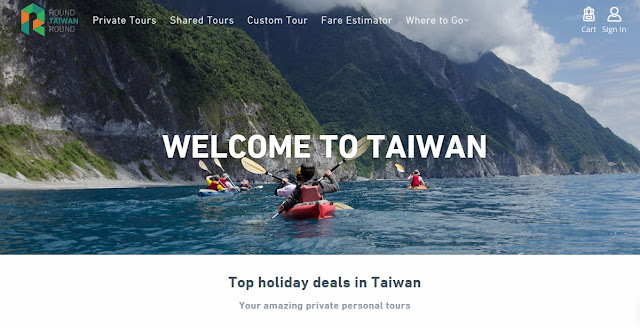 There's more than 2000 different Taiwan destinations. Your tour guides will also offer to help you take beautiful photos. They are very skilled so you do not have to worry! And for that, you don't have to carry around a Selfie stick at all!! 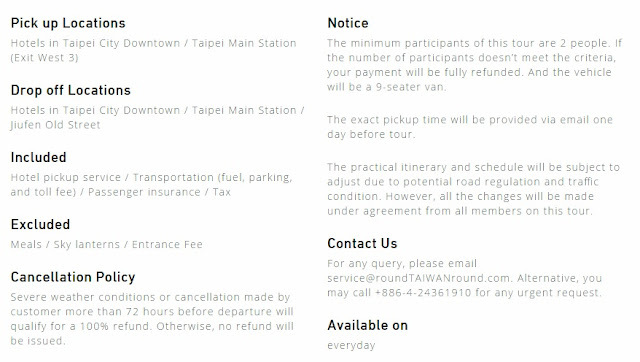 Round Taiwan Round focuses on promoting Taiwan travelling experiences the smart and fun way. 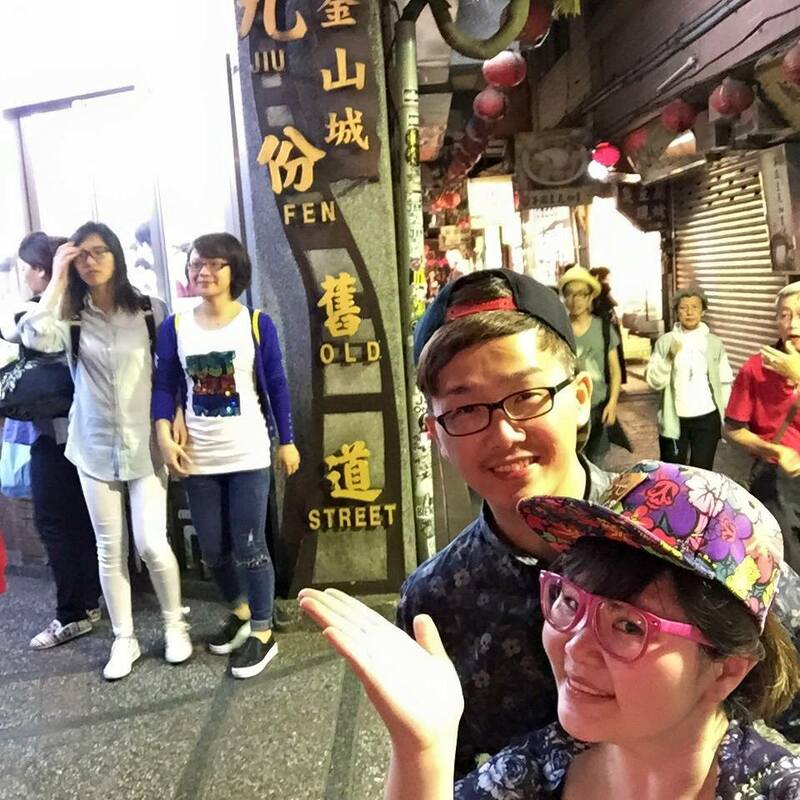 They engage with travelers from all around the world to make sure that they get the most out of this wanderlust, experience Taiwan the authentic way. All that sounds like very attractive, no? It sounds like a great way to see Taiwan at a different point of view and you get to meet new people who shares the same interest in travelling. That's practically hitting two birds with one stone! You may click below link to find out more! NOW, here comes the part that you guys are waiting for! The lucky winners will be contacted by email. "The minimum participants of this tour are 2 people. If the number of participants doesn’t meet the criteria, your payment will be fully refunded. And the vehicle used will be a 5-seater sedan, 7-seater sedan or 9-seater van, based on the number of participants." 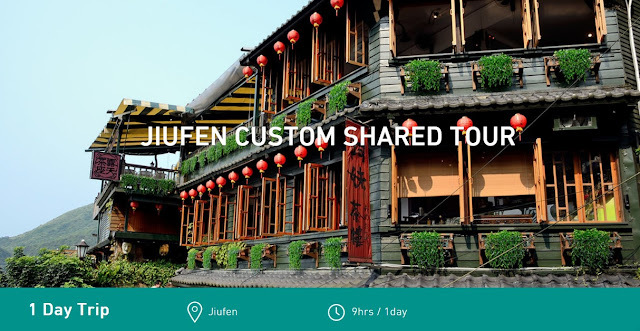 Click link below to find out how you could customize a Jiufen Shared Tour. Above is an example of the itinerary of the Jiufen tour with 6 tour spots selected. 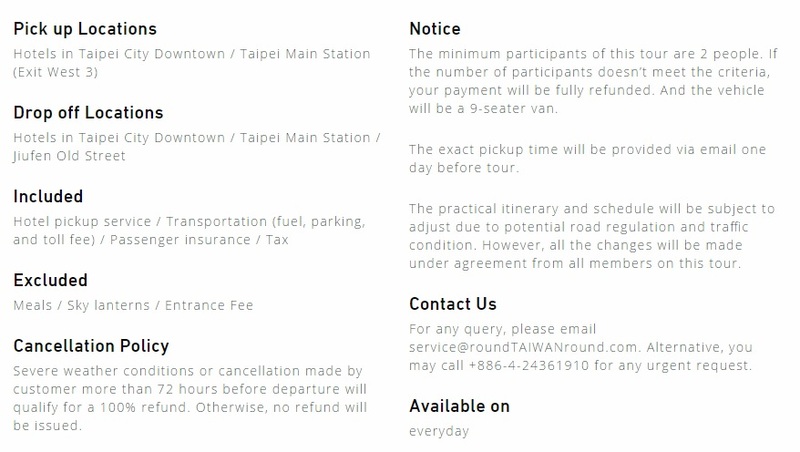 There's already 15 spots to choose from for Jiufen tour. You may also choose a Mandarin or English speaking tour. And also choose your pick-up and drop-off point. The price is US$30 per pax for Mandarin-speaking guide, but if you choose English-speaking guide, it would be about US$70. Nevertheless, they are still much cheaper than hiring a private driver. I have been to Taiwan for many times myself. In fact, I'll be flying there over in January next year. I really have to say that Jiufen is one of the places that I enjoyed myself the most. Be it for its food or sceneries. Feel free to look at my previous Taiwan posts. For the one about JiuFen, please click provided at the link below. Some of the MUST EAT in JiuFen are featured in that post. I also provided some travel tips before heading to Taiwan. I often have requests from readers asking me for itineraries. You can also feel free to ask from me too! You can say that I'm "KIASU" but I actually have my Jan 2018 Taipei Itinerary planned too! 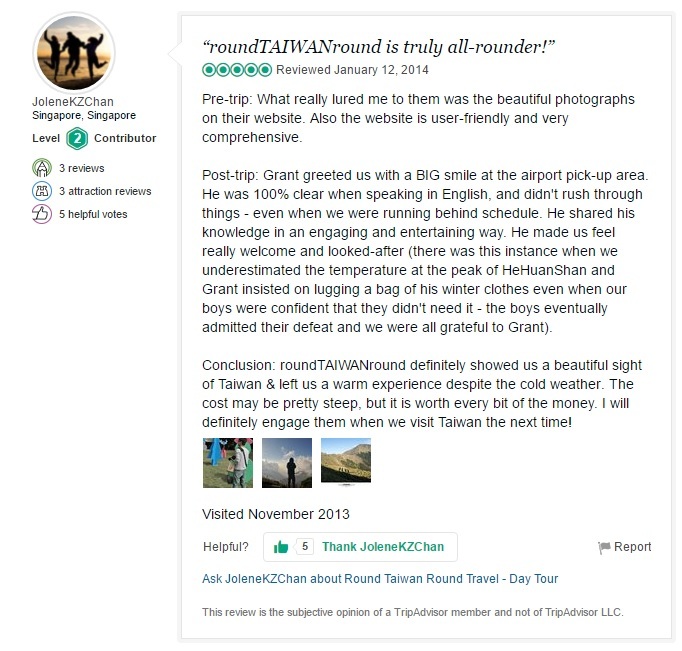 Round Taiwan Round or Round Taiwan Round Facebook. They are responsive and will reply rather quickly. Do you have the sudden urge to buy your tickets to Taiwan now? Will be awesome to win a pair of tickets for me and my bf! Hope I can get the free tics.. I hope to take a good break in taiwan! These vouchers for JIUFEN would come in time! Please allow me to win them!